No joke, I was left breathless and a little shaken after I finished this book, feeling like I had just stepped off the world’s scariest roller coaster. 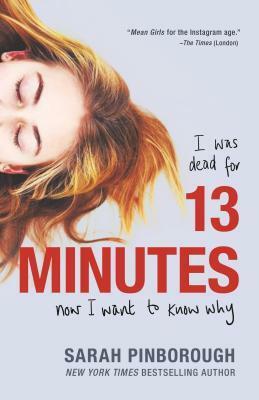 Being a fan of the author since her supernatural historical horror novel Mayhem, I knew full well her talent for writing thrills and dramatic suspense, but 13 Minutes was something else. This is Sarah Pinborough at her best. The story told through the eyes of two teenagers, who are as different as night and day. Smart, rich, and beautiful, Natasha is the most popular girl in school. Then there’s plain and self-deprecating Rebecca, who used to be Tasha’s childhood best friend before she was unceremoniously replaced as they got older, the dynamics of high school being as fickle and hard-edged as they are. Now Tasha and her two new BFFs Jenny and Hayley are the new queen bees of the Brackston Community School hive, while Becca has been cast aside, relegated to the bottom rungs of the social ladder. Then one day, everything changes. In the dark early hours of a winter morning, Tasha’s unresponsive body is pulled from the frigid waters of the River Ribble. Paramedics were able to revive her, but doctors say she was technically dead for thirteen minutes. When Tasha finally wakes up from her coma, she can only remember the horrible sensation of drowning, but nothing about what happened the night before or how she even ended up in the river in the first place. She does, however, have sick feeling that Jenny and Hayley might be involved, after noticing the strange way the two of them have been around her ever since she regained consciousness at the hospital. Convinced that she can no longer trust her best friends, Tasha turns to Becca for help. What can I say, but that might be one of the most understated summaries I’ve ever written for a review. I can promise that the full plot of 13 Minutes is way twistier and more intense, but of course I can’t go into the details or that would be spoiling the surprise. Once again I am amazed how Pinborough can throw readers completely for a loop, making you think you know what’s going on before flipping everything on its head and presenting you with another angle. Each time I thought I had the answer, a plot twist would rear up and smack away my smug confidence, keeping me guessing yet again. Incredibly, all the clues were always there in front of me, but since Pinborough is so good at subverting tropes and expectations, I never saw them until it was too late. Also, I would not hesitate to recommend this book to anyone, despite its official tag as a Young Adult novel. Unlike many of its peers in the genre, 13 Minutes does not pull any punches, nor does it talk down to its audience. On the contrary, it features a lot of mature themes, unflinchingly exploring the dark side of high school culture and revealing the all too vicious realities of being a teenage girl. Having been there and done that, I feel there’s definitely truth to the argument that girls can be just as nasty and cruel as boys when it comes to schoolyard bullying, with much of that aggression coming through in the form of manipulation and relational sabotage, which is no less emotionally damaging to the victim. My high school years were some of the best of my life, but I certainly don’t miss the petty squabbles and popularity contests. This book reminds me why, while also showing how much more extreme things can get in this age of social media and technology. Still, I don’t want to make it sound like this novel is full of nothing but teen drama, because the story’s tone is definitely more in keeping with a psychological mystery-thriller. Pinborough allows us a look into the fascinating minds of her protagonists as the two of them navigate a minefield of high school politics—but just enough. Both Tasha and Becca are clever young women who share a love for chess playing and solving puzzles, but to be a good strategist also means keeping a lot of secrets, and between them there are plenty of hidden motives. These are gradually revealed as the tale unfolds, holding me rapt with every new development. Needless to say, I loved this book to bits, and you can bet once the story sank its hooks into me, I couldn’t have put it down even if I tried. Of the half a dozen or so novels I’ve ready by Sarah Pinborough so far, I believe, without a doubt, that 13 Minutes is her finest work to date, blasting away my already sky-high expectations to become my new favorite book by the author. Brava, just brava. I liked her book Breeding Ground. Keep meaning to read more of her horror stuff but haven’t picked up any yet. I haven’t even heard of Breeding Ground, I have to look that one up! I’ve seen this one around and you’ve pretty much convinced me I need to give this one a try. I loved her “Language of Dying” so I know I like her writing style and I’m curious to read more. Great thoughts! She’s a great writer, and very versatile. This wasn’t much like Language of Dying at all, but it was amazing just the same! I’ve never read her! Which book would you recommend starting with? Barb has given me so many books for my TBR, but it sounds like this one demands to be read! Fantastic review! Whoa. Ok, I guess I need to track this down! Yes, I have a feeling you’ll love it! I really hated ‘Behind Her Eyes’, but I think I should give the author another try to see if it was just a bad experience or if she isn’t the writer for me! Glad you enjoyed this one – it’s always awesome when the author keeps you on your toes. I liked Behind Her Eyes, but I thought 13 Minutes was much stronger. Much more intense and mysterious! Yes, Murder and Mayhem were amazing! But this one was on a whole other level of intense! I couldn’t put it down! I adored this one. Me review will be up tomorrow. Loved getting yer take on it. It’s awesome. Good news is that she’s written such a wide variety of stuff, so there seems to be something for everyone. Ooh, I need to read more Pinborough. I was side-eyeing this, I wasn’t sure if it’d be my thing, but sounds like I should give it a shot. It’s wonderful! Hope you get to give it a try! Awesome! I heard great things when it was released in the UK. Now I know I need to read this asap. I just danced a little jig – I loved this too. I haven’t read Behind her Eyes although I’m sure I will eventually – but I thought this one was just excellent. It really was! I’d been waiting to read it for so long, I’m so glad it’s finally in the US! Well you’ve got me sold! I’ve been wanting to read more suspense/thriller books of late and this sounds like it will fit in nicely! Great Review! Aaaahhhhhh!!! You’ve made me want to read this RIGHT NOW but I have so many things waiting patiently to be read as it is! What a wonderful review, Mogsy! This one sounds excellent – I must get hold of it as I also think my teenage granddaughter would enjoy it. I really enjoyed this one too! I do think ye should give it a shot! I have yet to hear something negative about this book. Thanks for reviewing this one.